Have you been feeling a little…uninspired lately? Experiencing a bout of “designer’s block”? 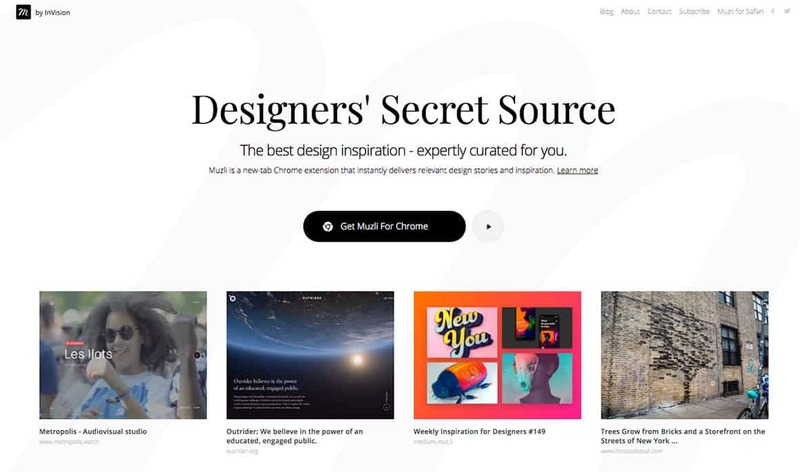 Well fear no more, because we’ve compiled a list of design inspiration sites that will tickle your creative bone and get you out of your rut. Dribbble deals in “shots” and no, we don’t mean the kind you get at your post-work happy hour. 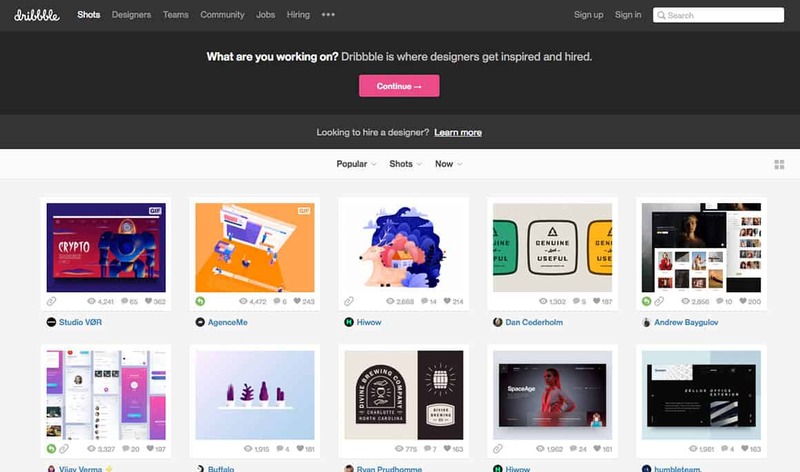 If you’re looking for some quick and dirty inspiration, check out Dribbble. Browse the endless catalog of images (no extensive portfolio pages here) or type in your topic of interest in the search bar and let Dribbble lead you to the promised land. Each click brings you to a single, stand-alone image submitted by graphic designers all over the world. These “shots” are like teasers from the artist of what’s to come. Many shots are works in progress, while others are the final product of a proud, doting designer parent. Designers can create their own pages in hopes of maybe one day making it to the top of the “Popular Designers List”. In the meantime, it’s a great place to keep and display your work. Dribble also has a blog and podcast where you can get design advice and in-depth interviews from site’s operators. Fun! If you’re looking for high-quality design inspiration sites, look no further than behance.net. First of all, the layout of this website is the definition of user friendly. Users can post “projects” which can be tagged under categories such as illustration, branding, graphic design, or photography. Click on whatever project looks interesting to you and a portfolio page pops up with images, videos, and GIFs. Behance also has live webinars, which can be accessed through the “live” link from the drop-down menu. 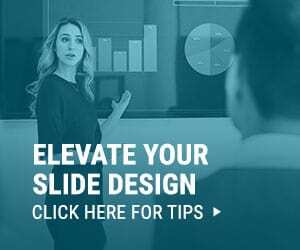 According to the schedule, the next couple of weeks are jam-packed with lessons from a myriad of well-known design experts. There’s even a live chat during the webinar where you can ask questions like “hey, can you repeat that! ?” and “how do I reposition an artboard?”. 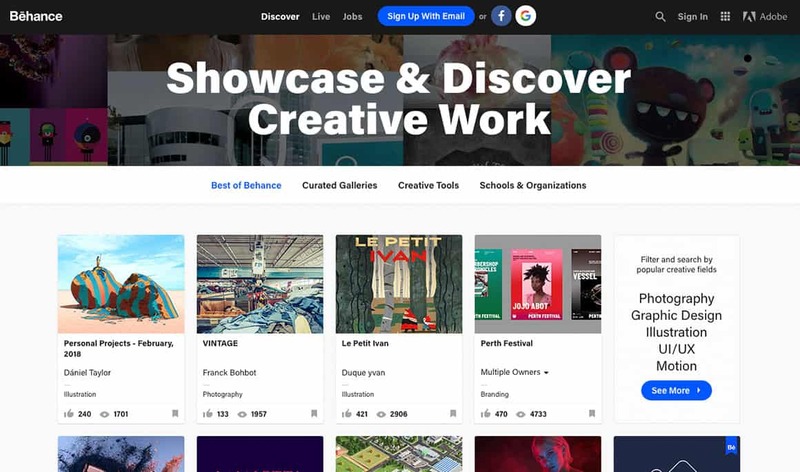 If you’re looking to browse some impressive portfolios and maybe sharpen your design skills and sense of community, click on behance.net! UnderConsideration makes it very clear that they are print only. They recently closed their doors in 2017, but that doesn’t mean you can’t still peruse their beautiful, high-quality images of printed design. There’s picture books, zine covers, posters, business cards, food packaging, and just about anything else that can be designed on a physical surface. We like to hit the “top ten tags” option and see what comes up. Under Consideration definitely whets our appetite for design inspiration, especially since everything seems to be on gorgeous, colorful cardstock. Who doesn’t love some good quality cardstock? Mr-Cup is graphic designer Fabien Barral’s pseudonym which he develops his own products under. His blog, mr-cup.com is a bit of a “boasting space” where he posts all of his favorite designs that he comes across on the web. The website itself is meant to sell his products, but the blog makes it worth the visit. He posts something new every few days or so, and it’s always incredibly innovative. Think of it as a curated collection of art, picked out by a highly successful and creative graphic designer. We’re into it! We also love that you can just scroll right through the blog without clicking on individual posts to see the images. Just a warning though: once you start scrolling, you won’t want to stop. 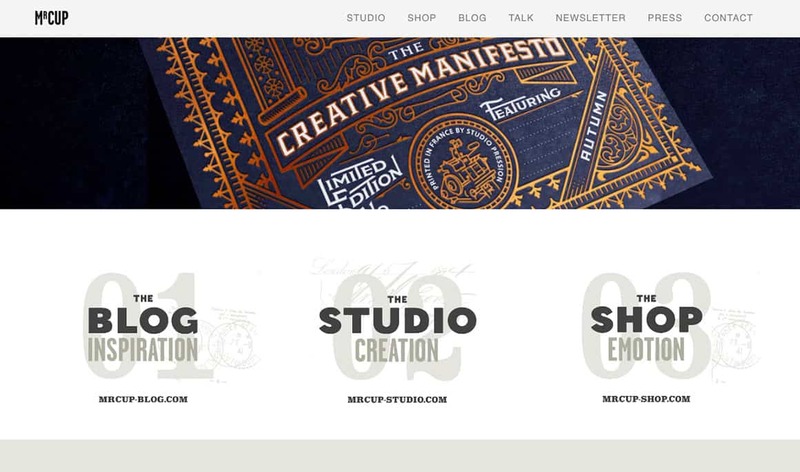 We know we can trust a design inspiration sites like this one because it has an impeccable layout. Everything about Abduzeedo is sleek, clean and by the looks of it…highly curated. 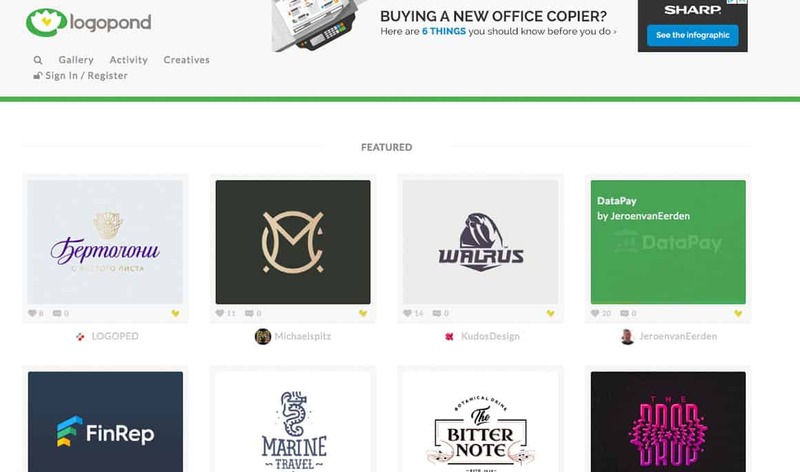 Unlike Dribbble and Behance, Abduzeedo is giving you the cream of the crop. 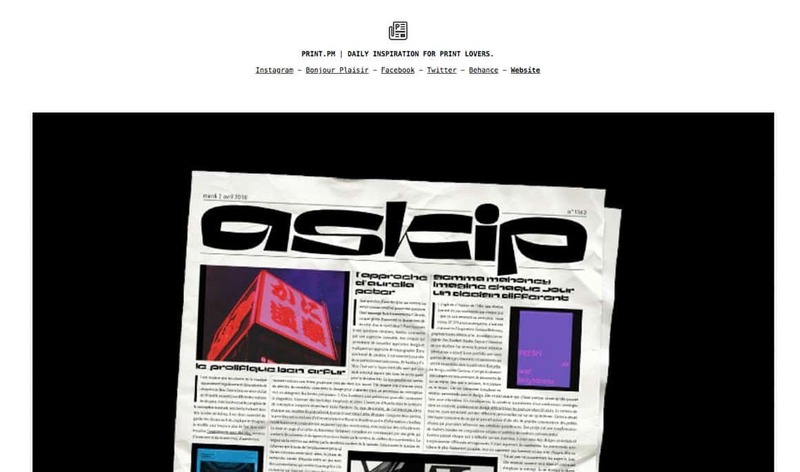 What started as the personal blog of designer quickly became the “it” blog of the design industry. Covering everything from architecture to brand identity to interior design, Abduzeedo presents only the coolest, slickest designs for the reader’s inspiration. Not only does Abduzeedo offer curated collections, but they also book recommendations and interviews with big-city designers. These come complete with beautiful, high-quality photos of the interview process. Very cool. If you want to check out the who’s who and the what’s what of the design scene right now…head over to abduzeedo.com and prepare to be amazed. Adsoftheworld’s layout is incredibly simple, which is one of the reasons why we love browsing design inspiration sites like this. 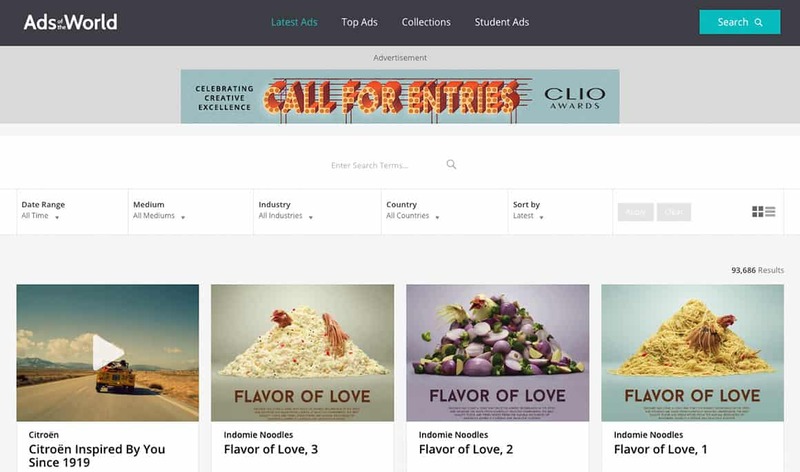 Browse ad campaigns by clicking on one of four categories: “latest ads”, “top ads”, “collections” and “student ads”. It’s very much a “gallery” style website with no weird frills or confusing tags — almost like a “gawker” for ads. 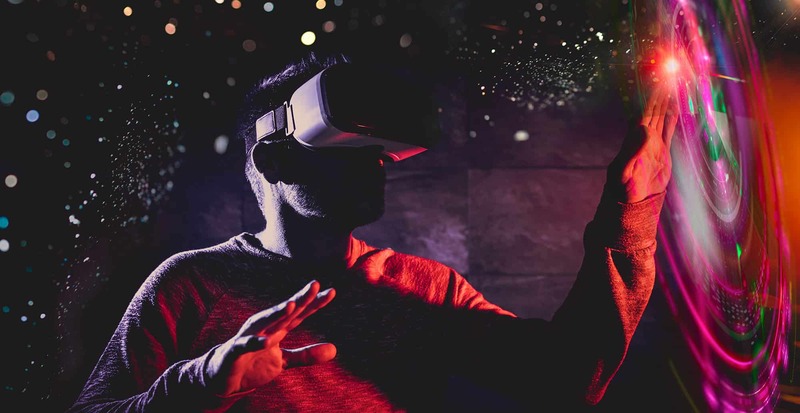 Start by scrolling through the latest video and print campaigns. 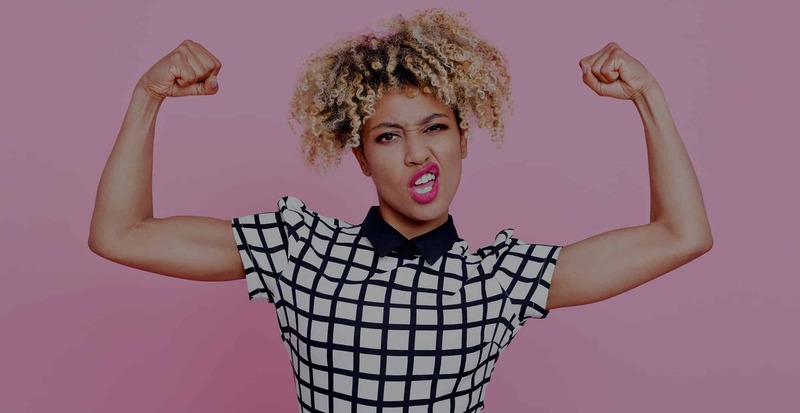 Then if you’re looking for a specific topic like “gender equality” or “super bowl”, click on the “collections” tab and find the exact type of inspiration you’re itching for. Can you guess what LogoPond specializes in? You guessed it, logos! If you’re feeling stuck on the inspiration front, head over to LogoPond to browse original logos created by designers from every corner of the world. Refine your search to “trending” or “recently posted” and just let the good times scroll! A person could spend hours on here clicking next…next…next. There seems to be an almost never-ending source of logos on LogoPond. Everyone and their next-door neighbor has heard about dieline.com. 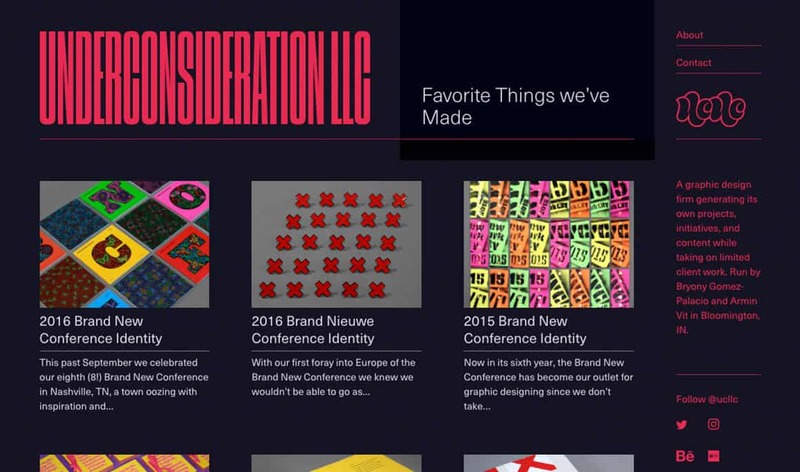 We couldn’t possibly make a list of design inspiration sites without including the all-mighty DieLine. If you’re looking for a highly active current blog with a heavy emphasis on packaging, head over to DieLine and get your click on! 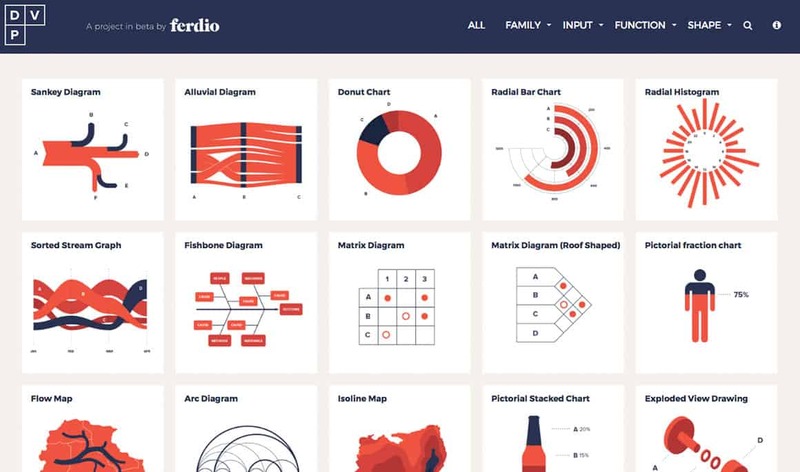 There is so much inspiration on this website, it can make a designer’s head spin. The blog is very “on posh” with articles like: “30 Packaging Designs That Feature The Use Of Two Colors” and “The Role Of Luxury Packaging In An Ever-Changing Cannabis Industry”. The site is heavily curated, which is why every single project on the blog is so dang beautiful! 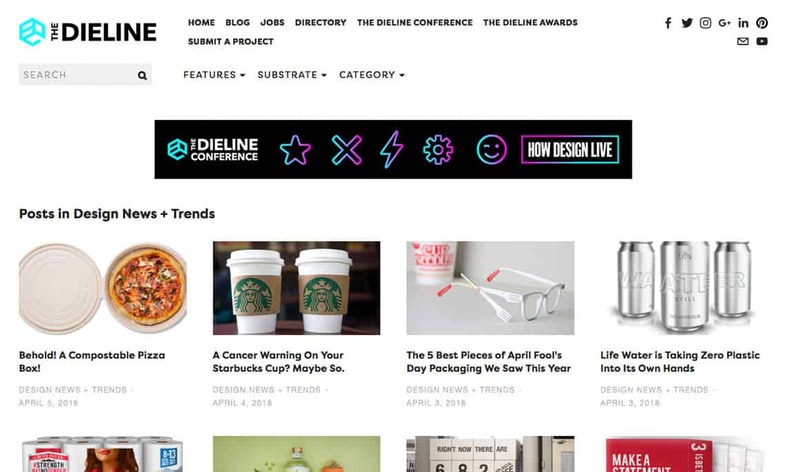 DieLine also features job postings and an option to submit your own work to the world-famous design site. Cut out a good hour to browse DieLine — you’ll need all the time you can get to gawk at the incredibly creative projects. 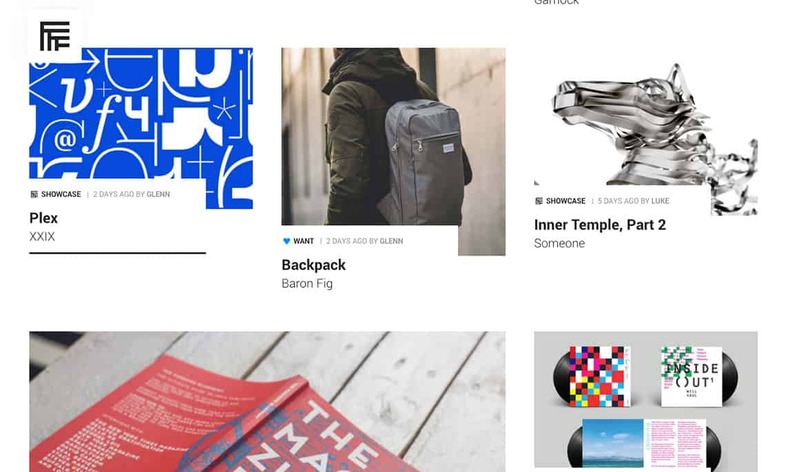 FormFiftyFive is a design sharing site curated by a super hip group of designers who definitely have a flair for quirk. You won’t be finding run of the mill designs here. FFF puts an emphasis on books and magazine covers, serving “slow-food” design with a retro twist. While you’re there, be sure to check out the FFF podcast, featuring interviews with top designers like Dave Sedgwick and Eike Konig. If you want to see what the cool kids are into nowadays, click your way overand may the hipster vibes be with you. 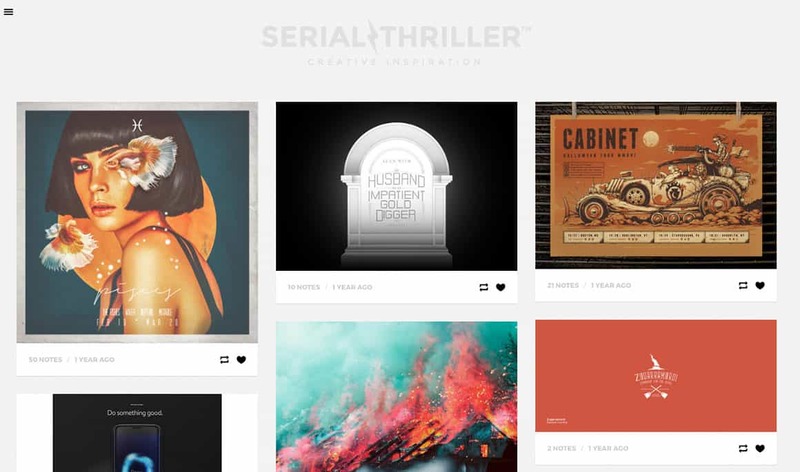 SerialThriller is like a really cool designer’s Tumblr that doesn’t involve Zac Efron GIFs. Imagine that! SerialThriller’s sub heading is “creative inspiration”, so you can bet that there’s a ton of design inspiration to spare on this site. We noticed that the site hasn’t been updated recently, which is a shame because the projects featured are incredibly bold and unique. Don’t expect new content any time soon, but check out what SerialThriller has in their archives to get your creative juices flowing. 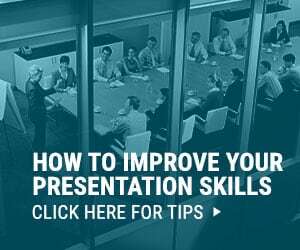 DataVizProject focuses exclusively on charts, graphs, and any other kind of data visualization. The layout is very clean and streamlined, with a strictly navy/red color scheme and a clear-cut gallery presentation of the visualizations. If you’re ever looking for a cool way to present data that goes above and beyond the basic line graph, DataVizProject will no doubt have plenty of inspiration for you! Muz is actually an app that delivers inspiration and design stories that are relevant to you as an individual. Pretty cool if we do say so ourselves! Once you download the app, you’ll have your own, personal gallery that keeps updating with designs that Muz thinks are suited to your style. 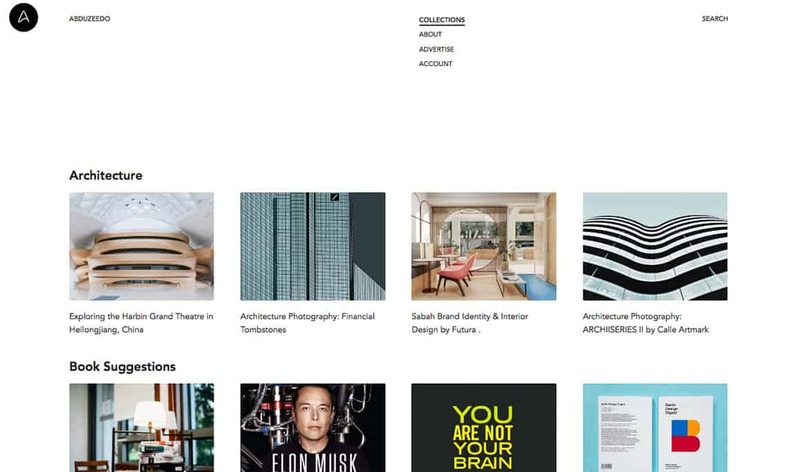 What we like about Muz is that every designer is different, so why not get your own gallery that’s specifically curated towards your current job, interests, and preferences? It’s a no-brainer in our opinion. Print.pm focuses exclusively on print, so that includes magazines, posters, books and cards. You know…all that ancient stuff. print.pm’s style appears to be a little bit vintage and a little bit “high-concept art”. If you have an affinity for 60’s mod, you’ll no doubt be drooling all over print.pm. 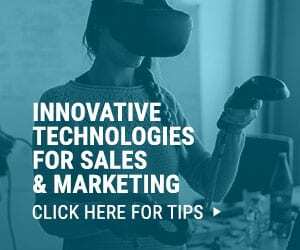 The site can also be scrolled right through like a classic blog, so be prepared to spend a good chunk of your workday browsing this super trendy site. It’s binge-worthy design at its best! Inspire your day with these creativity quotes or explore the latest trends and topics in design in our 2018 NINJAWARDS.